How’s life? The answer can depend on the region in which you live. Many factors that influence people’s well-being are local issues, such as employment, access to health services, pollution and security. 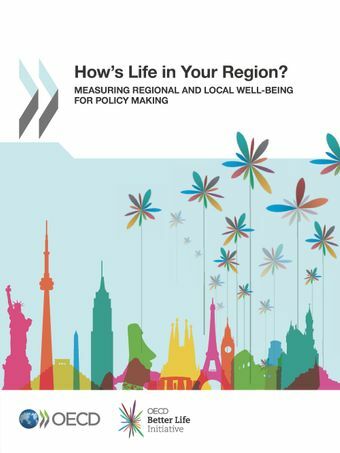 Policies that take into account regional differences beyond national averages can therefore have a greater impact on improving well-being for the country as a whole.This report presents the OECD analytical framework for measuring well-being at the regional level, as well as internationally comparable indicators on 9 well-being dimensions for 362 regions across 34 OECD countries. It also sets out guidance for all levels of government in using well-being measures to better target policies at the specific needs of different communities. Drawing on a variety of practical experiences from OECD regions and cities, the report discusses methodological and political solutions for selecting regional well-being outcome indicators, monitoring the progress of regional well-being performance over time, and implementing a process of multi-stakeholder engagement to promote social change. French Comment va la vie dans votre région? Spanish ¿Cómo va la vida en su región? German Wie ist das Leben in Ihrer Region? Italian Com’è la vita nella tua regione? Czech Jak se žije ve vašem regionu? Danish Hvordan er livet i din region? Dutch Hoe is het leven waar jij bent? Estonian Kuidas on elada teie regioonis? Finnish Hvordan er livet i din region? Hebrew איך החיים באזור שלך? Hungarian Milyen az élet az Ön régiójában? Icelandic Hvernig er lífið á svæði þínu? Korean 지역에서 삶의 질은 어떠한가? Norwegian Hvordan er livet i din region? Polish Jak się mieszka w Twoim regionie? Portuguese Como é a Vida na Sua Região? Russian Какова жизнь в вашем регионе? Slovak Aký je život vo vašom regióne? Slovene Kakšno je življenje v vaši regiji? Swedish Hur är livet i din region?